Batter Finger: It’s pointing! It’s pointing! Sometimes it’s not rude to point. Offering a friend or little one the chance to scrape the bowl after mixing up a batch of deliciousness definitely qualifies. 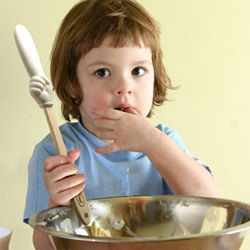 The Batter Finger makes making cookies, cake and brownies even more fun. The opportunity to share never tasted so good. The finger-shaped spatula features a long handle and flexible silicone end for easy use when creating sweet treats. Narrower than traditional spatulas, the Batter Finger can also be used to scrape out the last bit of peanut butter from the jar. Perfect, because doesn’t a peanut butter brownie sound really good just about now?